We worked closely with Iva for many years on a broad range of events and initiatives at the New World Symphony where we are exclusive caterer and she was Director of Special Events, and later, Director of Corporate Partnerships and Friends of NWS. Adriana Cadet of Creative’s Loft was the planner; she styled the event and coordinated everything. Q: How Did You & Cleaveland Meet? Iva: We met through the Miami music scene. I knew Cleaveland as a musician for many years before we became romantically involved – we first got to know each other when his band headlined a New World Symphony event. A few years later we ran into each other at iii Points music festival, and the rest is history. Q: Is There A Story Behind Your Engagement? Iva: Cleaveland proposed on Halloween night, 2017. We threw a big Game of Thrones-themed block party on our street, complete with a live band in front of the house. At one point he grabbed the microphone and got on one knee, right there in front of 100 of our dearest friends – it was unforgettable and caught me completely by surprise! 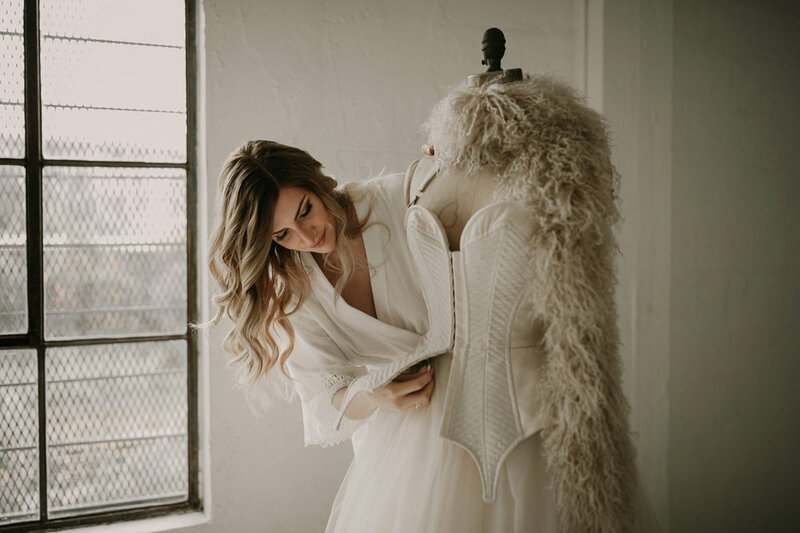 After trying on a number of gowns, none of which felt right, Iva saw “the one” in a campaign video for the Vera Wang Fall 2018 Bridal Collection, and immediately fell in love! 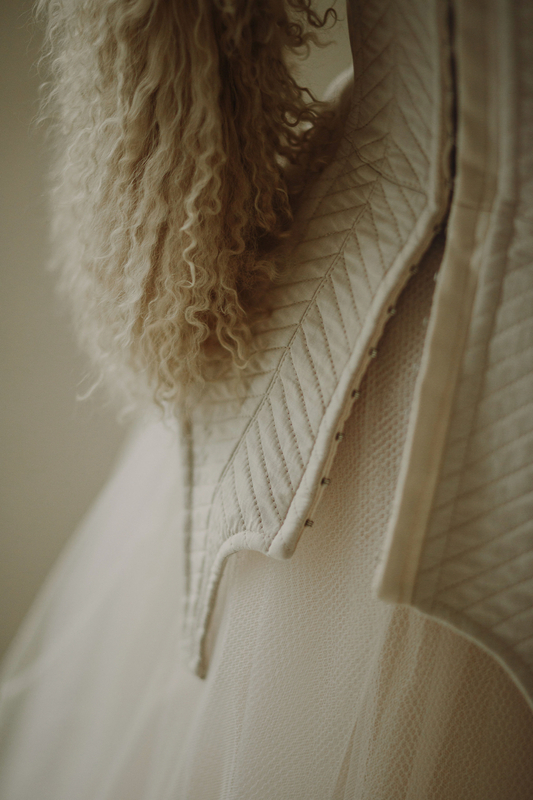 It was perfect; whimsical but graceful, fashion-forward yet romantic, edgy but timeless, at the same time structured and flowy. It also provided a great canvas for accessories, but was still interesting enough to stand on its own. The moment she tried it on at Ever After, she knew the search was over. 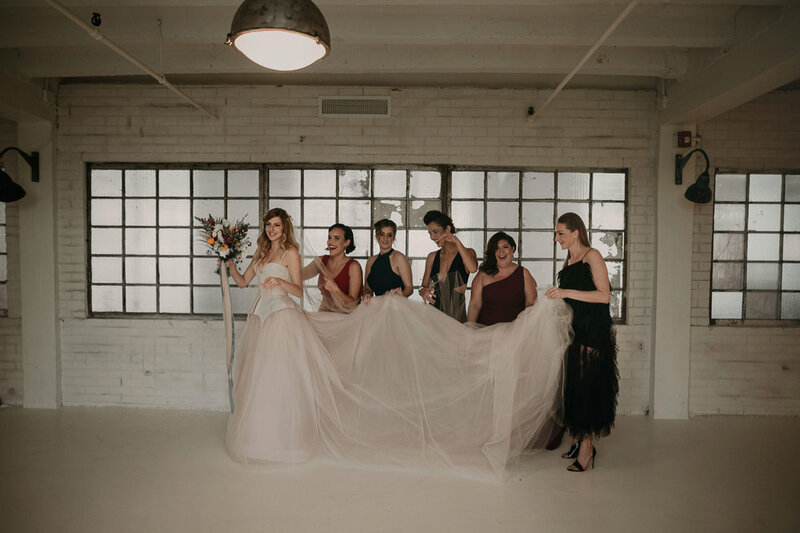 The team at Ever After, Miami Atelier, customized the gown by separating the tulle skirt from the corset and creating a new skirt for the late night festivities, so now she has three beautiful separate pieces that can be worn in the future. Iva’s something old, something borrowed and something blue were all contained in a single object; an antique gold mesh purse with a cabochon sapphire that belonged to Cleaveland’s great-grandmother. The couple paid homage to their parents with decorative details throughout the venue. Iva was born and raised in Croatia and wanted to incorporate a Croatian element into the décor, so they sprinkled licitars—red heart shaped biscuits that are a traditional symbol of Zagreb, Iva’s hometown—throughout the venue. Both their mothers are artistic and love painting, so they had art stations with easels, canvases and art supplies. Guests were encouraged to draw and paint. They were excited to find a vintage Vespa in the venue’s props inventory because Iva’s father owned one when her parents got married in the early 70s. Her family’s photographs from that era with the Vespa remain etched in Iva’s memory as they just radiated romance! Being able to include the Vespa as part of their wedding decor meant a lot to Iva, and her dad had a lot of fun taking pictures with it! The decor also included leather Chesterfield sofas, reminiscent of the ones in Cleaveland’s father’s office. Another fun element was the “House Kosović Duvin, EST. 2018” neon sign, produced by Brite Lite Tribe. It played a role in the ceremony (lighting up at the moment they were pronounced husband and wife.) The sign provided a great visual element and now hangs in their living room as a memento from their big day. To accentuate the decor, guests were encouraged to wear vintage and retro styles. It was impossible for the couple to include their much loved pets (a dog and a cat) in the festivities, so they had the photo booth vendor, Juju Booth, create giant cardboard printouts of the animals’ heads. This way anyone who wanted could take photos with them throughout the night; it was an adorable element and the next best thing to having them there! Iva: We were both present at the cocktail hour, and in a special nod to my parents, during this part of the evening, I wore the red dress that my mother wore when she married my father in 1973. Iva: Most of the highlights were musical in nature – music has been an integral part of both our lives since before we knew each other, and we grew together as a couple through music. I loved the moment when Cleveland sang Gregory Porter’s “Real Good Hands” for my parents. He later surprised me by singing Tom Petty’s “Here Comes My Girl” to me. Instead of vows, we recited the verses of Stevie Wonder’s “As” to each other. We both walked down the aisle with our parents to “Rain Song” by Led Zeppelin. Our first dance was to Leonard Cohen’s “Dance Me to the End of Love.” Hava Nagila was amazing! Our band, the French Horn Collective, provided the magic that tied the vision together - they were absolutely perfect. And DJ Tom Laroc kept us dancing until the end. 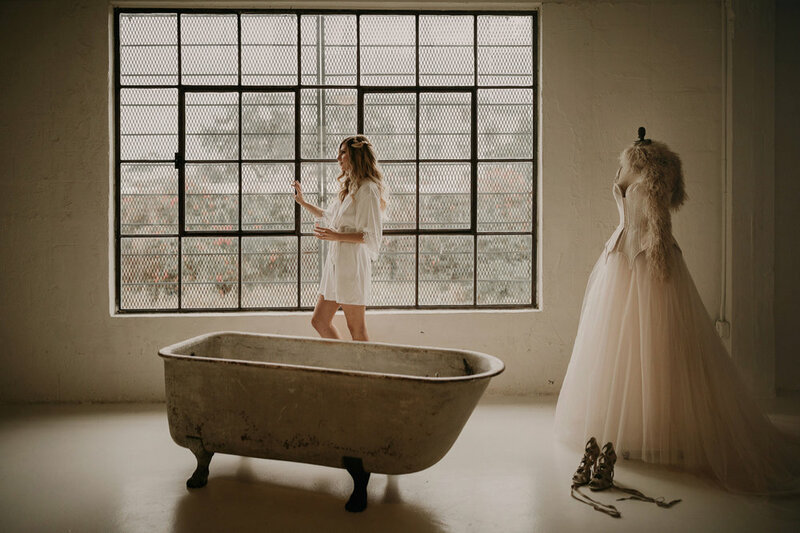 The venue was truly the star of the show, as it contains thousands of props and vintage furniture pieces that they could choose from, and the Creative’s Loft team did a fantastic job curating the right mix. Iva: I wanted it to feel a bit shabby-chic and theatrical, like a 1930s Parisian café, or a turn of the century circus. It was important to create a memorable experience that would veer away from a traditional by-the-numbers wedding, while still being romantic. In terms of color palette, I wanted rich hues – teal, red, burgundy, marigold, with elements of patina. Most importantly, we wanted great food, good music and lots of humor and little details to honor our families. And we wanted it to be a bit crazy, with a touch of rock’n’roll! Iva: The team at Flower Bazaar, led by my dear friends, Thierry Adam and Leonardo Lanaro, designed the florals, which perfectly complemented the venue and the overall vision. I had a particular Salvador Dali painting in mind as the inspiration for the flowers: a single yellow bloom with butterfly wings along the stem – they captured that feeling perfectly. Iva: I wanted it to be unusual and out of the box. I drew a lot of inspiration from the venue—Ace Prop House + Studios—which is an incredible space filled with unexpected objects from bygone eras, expertly designed in a surreal, almost phantasmagorical way - an absolute feast for the senses. I visited the space for a photo shoot long before I was engaged, but even then I thought it would make for a great wedding venue. We’ve noticed a majority of weddings, and many very upscale receptions, are now opting for the more casual, sociable food stations as opposed to seated dinners served by waiters. We’ve also noticed a major trend towards simpler “comfort food” for formal wedding receptions as opposed to more stylized plating. Food Stations mean guests are getting up and mingling, rather than everyone staying seated and speaking only with the person next to them. Iva and Cleaveland’s reception featured food stations too. Iva: We wanted our guests to have fun, and to be able to choose from an eclectic menu that featured some of our favorite foods; Korean buns, Indian cuisine, and comfort bowls. Seating was generally unassigned and guests could choose between more traditional tables and lounges. Instead of a cake, we opted for passed dessert and late-night doughnuts from Salty Donut. I also didn’t want to leave our guests hungry before the ceremony, so we had an hour-long pre-ceremony cocktail reception with passed hors d’oeuvres.